From the Shakespeare Unlimited podcast series. Published May 29, 2018. © Folger Shakespeare Library. All rights reserved. This podcast episode, Bear It, As Our Roman Actors Do, was produced by Richard Paul. Garland Scott is the associate producer. It was edited by Gail Kern Paster and Esther Ferington. Esther French is the web producer. We had technical help from Andrew Feliciano and Evan Marquardt at Voice Trax West in Studio City, California, and Robert Auld and Deb Stathopulos at the Radio Foundation in New York. We’d also like to thank ‘Illuminations’ for allowing us to use excerpts from their DVD of the Royal Shakespeare Company’s 2012 production of Julius Caesar. 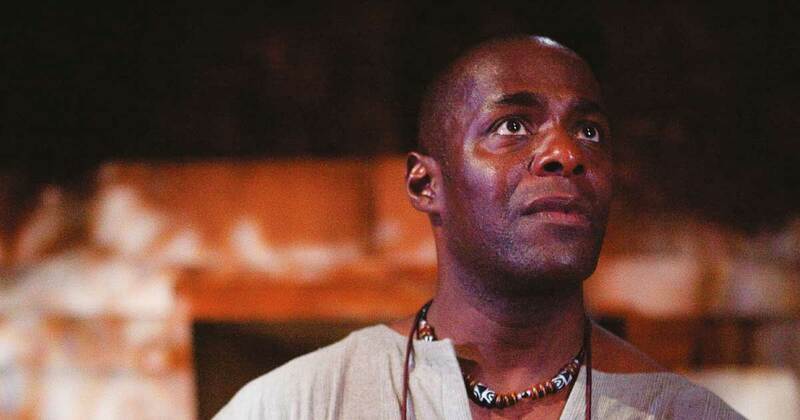 Paterson Joseph is an acclaimed British actor who has performed major roles with the Royal Shakespeare Company and the National Theatre, including the title role in Othello and the leads in The Royal Hunt of the Sun and The Emperor Jones. He has also worked extensively in film, and in television, including recently The Leftovers and Timeless. In 2015, he wrote and performed his one-man play Sancho: An Act of Remembrance on tour. Julius Caesar and Me: Exploring Shakespeare’s African Play was published in the US by Methuen Drama, a division of Bloomsbury Books, in 2018. Read an excerpt on the Shakespeare & Beyond blog. MICHAEL WITMORE: A few years ago, the Royal Shakespeare Company decided to make what was, for them, a groundbreaking choice. In 2012—76 years after it was first done in the US, 15 years after it was first done in Canada—the RSC decided to stage the first-ever high-profile, all-black British Shakespeare production: Julius Caesar, set in Africa. As it turns out, the experience was so remarkable that the actor who played Brutus decided to write a book about it. From the Folger Shakespeare Library, this is Shakespeare Unlimited. I’m Michael Witmore, the Folger’s Director. The actor was Paterson Joseph. And the book is Julius Caesar and Me: Exploring Shakespeare’s African Play. Joseph was at the National Black Theater in Harlem recently, performing his one-man show, Sancho: An Act of Remembrance, about the first black man in England to cast a vote. We invited him into the studio for a talk. Julius Caesar and Me takes an unflinching look at Joseph’s experiences at the RSC, both his time in 2012 doing Caesar, and in the 1990s, when this son of St. Lucian parents found himself one of only four black people in the building. He also talks about his early work, performing the sharp and boldly reimagined Shakespeare of the Cheek by Jowl company, and his thoughts about race in the British theater, about the proper way to play Brutus, about Received Pronunciation, and much more. We call this podcast “Bear It, As Our Roman Actors Do.” Paterson Joseph is interviewed by Barbara Bogaev. BARBARA BOGAEV: Paterson, you write in your book that before you started work on this RSC production, you had some doubts of your own about whether it was appropriate to set Julius Caesar in Africa. So what were you concerned about? PATERSON JOSEPH: I think it's just one of those things that, as a performer who happens to be black, sometimes you have to be a bit careful about not allowing that to be a sort of shtick really, and like, “Oh look, we're going to do a black production, so let's get some black actors in.” So I wanted to be very careful. I sort of sidled into it just to make sure that it was all above board and we were doing this for the sound reasons, not just because it would be fashionable. But no, it was a well-founded reason for doing the show, so that wiped out that fear. BOGAEV: Yeah, I imagine some of what you’re talking about maybe comes under that category of the “Disneyfication” of Africa, a concern about that? JOSEPH: Yes. Yes, I don’t know where he got that from, but it’s a Cyril Nri, who played Cassius in this production, it’s one of his phrases. But I think it's a good catch-all phrase to say “Look.” I think the Irish have the same thing. They call it “fiddly-dee Irish.” Sometimes when Americans do Irish, they’re all kind of leprechaun-y? And for Irish people it feels really insulting. I lived in Dublin for some time, I have very many Irish friends and they do balk at that. So I think the equivalent is, yes, the Disneyfication of Africa, sort of making Africa look exotic. BOGAEV: Right, so you did have these leprechaun-ish issues going on, and you say that even before the read-through you went in to talk to the RSC about this production, and that the director, Greg Doran, pretty much won you over. How did he do it, and what was his explanation of why Julius Caesar is Shakespeare's African play? JOSEPH: Well, one of the things he said to me was, “Look, I’ve wanted to do this play for very many years, decades in fact.” Whenever a director starts conversation like that, I tend to be on side already, because a burning desire to do a show is not the same as, “Look, it's on the schedule. We’ve got to do it.” Which obviously happens in a big institution at the Royal Shakespeare Company. JOSEPH: Exactly, yes, but this time I really felt very strongly that Greg's connection with the African continent was personal. His husband is Sir Anthony Sher, who’s a South African-born actor. BOGAEV: Recently on our podcast. JOSEPH: Ah, well, yes, one of our great, obviously, Shakespearean actors. So that he had sound reasons for doing it, because he’d also spoken to the leading figures in South African theater. John Carney in particular, who was a stalwart actor at the Market Theatre in the time of Apartheid, working with Athol Fugard and the other great playwrights at that theater, and it was John who said, “Well, it’s clearly Shakespeare African play, because it follows a certain pattern. Not all African countries have been through this, but more than we’d like. A great leader, a rebel, usually prosecuted by the authorities, then released, becomes the leader. Everybody follows him, and there’s a consolidation of power, which leads to a kind of dictatorship. Men are flesh and blood, and apprehensive. BOGAEV: This was actually our very first podcast on this series. JOSEPH: I mean, what a wonderful way to start. I mean, there’s such humor about that, and I love humor in darkness. They were so cheeky. They thought, “Listen, the authorities are so dumb, they won’t even open this book,” and then this was, as you know, handed around to many of the—well, all of the inmates had a go at it, and everybody annotated their favorite section, and the most annotated in that prison at that time was Julius Caesar. BOGAEV: And Greg told that story at this meeting? BOGAEV: It's so interesting to talk about this as if it's something new, because this process of reframing Shakespeare in Africa, it's something that has happened before on the continent in the 1960s, and we've talked about it on this podcast too, that Julius Caesar was staged all over Africa in a lot of different African languages. BOGAEV: Exactly, subversively. Really just the way Shakespeare, in Shakespeare’s time, these plays about anarchy or revolution or ones who were critical of the monarchy were just thinly disguised by setting them in another time period or country. JOSEPH: Mm, such a great line, isn’t it? It’s so well balanced. JOSEPH: I mean, I think about Bashar al-Assad, and I wonder about him. You know, he was educated partly in the UK. So was his wife. I can’t believe they didn’t imbibe some of that tradition of fair play. I know that’s part cliché, but there is a lot of that in the British still. I can’t believe that he can be that cold-hearted about his people, that there must be a struggle somewhere in that man, but he has literally done what Shakespeare wants. He’s disjointed remorse from power. BOGAEV: So he’s enunciating it for himself. Because that’s how you play it, I would say. JOSEPH: Yeah, that’s exactly how I wanted to play it. I wanted him to think it through there and then. The Tarquin drive when he was called a king. JOSEPH: The dictatorship that’s going to lead to a monarchy can only be stopped by the death of Caesar. Now, how do I justify that in myself, and allow myself to sleep, because I haven’t been sleeping? But he has to fight this with logic, and the logic he brings is “This is to stop what will happen in the future, what I believe Caesar will become,” and it’s not a very convincing argument in some ways, but it’s the best he can come up with. Thy full petition at the hand of Brutus. BOGAEV: Can we talk about the accent now? Because we hear in this clip, you're not speaking received pronunciation but a kind of African accent and that the whole production, naturally, is in this accent. It’s set somewhere in a Africa, and that this was originally your idea, at least the accent part of it. Tell us about that, because you say it was a bit of a controversial issue. JOSEPH: What I specifically wanted was an accent that was not syllabic. West African tends to be syllabic, and that means a heavy emphasis on most syllables obviously, and it lends itself to poetry to the extent that if it's rhythmic poetry it's great, because it has the duh-di-duh-di-duh-di-duh-di-duh-di in it anyway. But because we know that this is an underlying rhythm, that the iambic pentameter rhythm is an underlying rhythm, and we don’t hit it strongly. We don’t go “To be or not to be, that is the question,” because that’s not how people speak. So in order to make it smooth, and we don’t have something that… forgive the… I’m rather doing it just off the top of my head, “To be or not to be, that is the question.” We don’t want that, because what that does is it makes you listen to the rhythm rather than the words. On the eastern side of Africa, there is a more, I would describe it as a more lyrical way of speaking. So that instead of having “To be or not to be, that is the question,” you would have, “To be or not to be, that is the question,” and I thought that that would lend itself very well to the rhetorical speeches in Shakespeare, in a way that perhaps The Comedy of Errors might really lend itself to the syllabic West African sound. BOGAEV: This is so interesting. This is explaining how you picked the accent that you did pick, because as you say or imply, Africa is a continent of what, some 1,500 languages, and even more dialects and accents, and your initial idea though to use this East African accent I understand wasn’t all that popular with the cast. JOSEPH: This is much easier for us to do like this. Yes, you know the accent because you trained at it, but we don’t.” Now, I had only mooted that, I hadn’t said that I was going to do it. I said that, “Look Greg, if we did an accent, what do you think it will be? My suggestion would be this,” and so we had a bit of a discussion about it. BOGAEV: And I love your story about some friend of yours in New York thought you were doing a Scottish accent. BOGAEV: [LAUGHS] It’s really throwing you for a loop. JOSEPH: You know, “Richard Burton, that wonderful Valleys accent. Anthony Hopkins—“ and I was like, “Did I sound like that?” It took me a long time to get over that, but thankfully everybody laughed at it when I told them and I got over it. Jeffery Kissoon as CAESAR: What man is that? Fellow, come from the throng. BOGAEV: Well, besides the accents, what else was African about this production? JOSEPH: Physicality, I think. The way of expressing oneself. The way that you can become very fiery very suddenly and express yourself in a fiery way and then pull back. BOGAEV: Ah, a kind of Lion King gloss. BOGAEV: That would’ve been horrific. JOSEPH: So that would have been a proper Disneyfication of the whole setup. But because we have this wonderful choreographer, Diane Mitchell [Diane Alison-Mitchell], she knew how to ground us I think in an African physical expression, and then we had Then we had a [Akintayo] “‘Tayo” Akinbode, who was wonderful with the music, and so setting up a New African nation helped us, not just ground us in the African setting, but helped us to understand the passion with which we were going to do this play, the sort of openness and physicality that we were going to do this play in, and it worked. And if not so, how should I wrong a brother? Speak your griefs softly. I do know you well. BOGAEV: Julius Caesar speaks on so many levels. As you point out, it’s political, but Shakespeare is really brilliant at bringing the domestic to the political. You definitely see this played out in Brutus's scenes with his wife Portia, and of course in this close relationship he has with his conspirator and friend Cassius. You write early on that you realize that Brutus and Cassius carry the emotional through-line of the play. That scene after scene, you two are either conspiring or violently arguing, and one of the obvious examples of this is the tent scene, after Caesar has been killed, and Brutus and Cassius, they’re wrangling. JOSEPH: Oh, yeah, wrangling is a very polite term. Bickering is also a very polite term. I don’t know, anybody who’s got a sibling, and you have a dispute with them, they’re the people who can touch a button in you that delivers a rage that no one else can touch, and these two very smart men… they almost get to the point of going, “Oh, you think you’re the big one?” “No, you think you’re the big one.” “I’m older than you.” “You’re older than me, but I’m stronger than you.” and literally you think, “These men are the highest intellect in Rome?” There was a rehearsal where we just went all out and drove at each other like children, really demonstrating that part of the text, and it worked like a dream. JOSEPH: Who cares? Who cares about this guy? BOGAEV: Yeah, all of a sudden they’re shouting at each other. Because I knew the man, was slighted off. That every nice offense should bear his comment. JOSEPH: The truth of the matter is the argument is about you two. It’s about power, and it’s about, “We did this thing. It went wrong. Whose fault was it?” and rather than talking about that, they talk about somebody else. As we do, right? JOSEPH: “You’ve taken my Cheerios! How dare… I told you, that was my milk! You’ve taken my milk out of the fridge!” But that’s not what it’s about, and that’s the genius of Shakespeare’s domestic scenes. He makes his characters, I think I do say it at some point, he boils them down to their human essence. BRUTUS: Go to! You are not, Cassius. Urge me no more. I shall forget myself. Have mind upon your health. Tempt me no farther. BRUTUS: Hear me, for I will speak. O you gods, you gods, must I endure all this? All this? Ay, more. Fret till your proud heart break. You stared upon me with ungentle looks. And too impatiently stamped with your foot. JOSEPH: And he says nothing. This rather verbose man says nothing to her for ages, so she has to keep… Shakespearean women do not badger their men. They’re very much cleverer than that, thank you very much. Shakespeare’s written characters that are intelligent, all of them, and so she touches him where it hurts: his truth, his honesty. JOSEPH: It’s a beautiful, emotional, logical argument that totally floors him, and it’s so domestic and beautiful. BOGAEV: It is, and Brutus is very, very accessible in the way that you play him. In fact, he whips back and forth in his loyalties and his emotions, and as the play goes on, he’s increasingly unstable. Of course, he hears people talking to him. JOSEPH: Oh, that guy, Holy Wayne. Oh my gosh, what a madman. BOGAEV: You played a cult leader… well, right. Although you play him as a mad person who’s very sane, or perhaps maybe a sane person who is totally mad. JOSEPH: Well that’s it. Yeah, no, you caught it in a nutshell actually, that juxtaposition. I think it was, possibly a Laurence Olivier quote, but he may have got it from somewhere else, where if you’re playing somebody who’s old, find out where they’re young in spirit, and if they’re meant to be young, find out where they’re a little old, and I think that works for everything, that there should always be a kind of juxtaposition between what you’re meant to be, because we’re all a mixture of one thing and another. And with Brutus, I’d noticed very early on, as I say in the book, how quixotic I suppose you could say he is. You have to be, I thought, on the moment, because if you set up this blanket “He is a Stoic,” it would not only be rather boring, but also you’d make him less human, and that’s the beauty and the genius of Shakespeare, that he can balance those two things so easily. JOSEPH: It wasn’t my first rodeo. JOSEPH: Yeah, so I wasn’t the only black actor, but yeah. No, there were four of us in a company of 85. BOGAEV: Ah, now what is it that people do to make one feel like a curiosity? JOSEPH: I think just, if you had four women in a company of 85, you’d be a curiosity as well, and actually people wouldn’t notice you in a way that you would not be noticed if there were 20 women, and in some ways it’s a pressure on you, and it’s a pressure on the organization. Because if you’ve got those four actors, you’ve got to do something about that. You couldn’t have a token, you’d have to put them in positions of prominence. Now, it’s fine. You’ve hired four people. You’ve presumably gone through the whole process, they’re four people who can handle what they have to handle in order to do the job well. But what if they go, “Well, oh gosh, we haven’t got any. Let’s get five in.” And they’re not quite up to the mark. Because it’s going to happen. What happens then? When people go, “Well of course, yes. That’s why they don’t have them here, because they’re not very good.” The RSC, the very first time I was there—it wasn’t the institution that was doing it to me, it was the fact of me being only one of four. BOGAEV: It sounds like a board game or a quiz show. JOSEPH: I know, I know, and you know, these things still come back unfortunately. They do come back every now and then. JOSEPH: Yeah, I mean, embarrassing for them. I do, I mean honestly, I have some sympathy. BOGAEV: With good intentions, yes. JOSEPH: Really good intentions, because of course they didn’t want it just to be white people seeing the show. But, honestly speaking, please look ahead. I think that the RSC has certainly made some inroads and they learned a lot from our production, but you know, it was the first. So I can see why it was a new thing for them, but we were in 2012. It was a struggle for us to not be insulted by that, but at the same time, we all thought, “Well, you got to get bums on seats,” and you know, the black British populace, and I’ll say this very freely, are not brilliant at supporting black performers in classical plays. Partly because it’s not part of their culture, that’s not the thing that they do. We’re not great theater-goers, that’s just the truth of it, and also there seems to be, in terms of theater in the UK, an educational level that has to be reached before you see people; I mean, I’m talking about white working-class people, seeing people in the theater, because it’s not part of their tradition. Why? I would say, it goes back to school. The majority of grammar schools, which are the schools that have the sort of pupils with the best records, and private schools where you pay, have a big arts side to them. So it becomes part of your culture as a kid. If you suddenly are asked at 25, and you’ve never had any dealings with theater, “You should be going to the theater.” “Why?” “Because there are black people in it.” I don’t go to rock concerts, not because I don’t like rock, but because I was never introduced to it as a kid. Unless it’s introduced at an early stage, it’s very hard to get people into a theater, and I think that’s part of the issue too. JOSEPH: Hmm, yes. Lovely word. Yeah, that’s Adjoa Andoh again. Yes, once again, yeah. BOGAEV: Yeah, and it made me think, here you have performers and directors who feel that we are in a post-race place in theater and film, but some feel just the opposite. I mean, for instance, Greg Doran at the RSC had a black Cordelia. You know, there’s quite a bit of diversity casting as you say now at the RSC. But diversity casting is still a way to make an exception for different races. So how do you see this point in Shakespearean theater vis-à-vis of your race? JOSEPH: Yeah, that’s a big question. I think the ideal is that there is no difference between an actor of Indian ethnicity, African, Afro-Caribbean ethnicity, or any of the European ethnicities or Middle Eastern, et cetera. I think that when we get to a place when we’re not seeing it, that's ideal. Why could you get away with this in theater, in a way you can’t get away with it so much, or not allowed to get away with it so much, on film? Because film traditionally has been a depiction of, quote-unquote, “reality.” In the theater, because you've already gone in there and pretended that this stage, which is in at the middle of London, is actually Africa, and these people on stage are in funny costumes, and they’re pretending to be dukes and duchesses, but I know that guy, he’s in that soap opera that I watch. That reality’s within you and is within the performance, and as long as they’re convincing and are convinced, you all tend to be convinced too. BOGAEV: And more specifically to Shakespeare? You know, in the 1980s, playwrights like August Wilson said black performers don’t need Shakespeare. They should be doing work by black writers. Is that time passed as well, or do you still feel that there isn’t quite an equal place at the table for black artists in the Shakespeare theater world? JOSEPH: I just think it’s what you want to do. I mean, if I want to do Shakespeare, I should be allowed to do Shakespeare, right? I mean, if I don’t, if I think it’s not my interest, then I’m allowed to ignore it. I don’t know if Shakespeare should be seen as anything other than one of the playwrights, of course. For those of us who loves him, he’s the greatest. But not everybody loves him, and that’s okay. That doesn’t make them philistines or stupid. It just means he hasn’t hit them. He hasn’t—the bug hasn’t been sort of delivered to them, if you like. The Shakespeare virus. But those of us who caught him early, or caught him at a time when they were forming their own opinions about what the world was, we’ll always feel an ownership of Shakespeare, no matter who tells us we’re allowed to or not. It’s nothing to do with an outside authority telling us he’s ours or not. It’s to do with our own desire to connect with him, and to connect with his themes, which are universal and international, and should never ever be ethnically put in a box. BOGAEV: Well, I’m really glad you caught the bug so I can get a chance to talk with you on this podcast. Thank you so much, Paterson. JOSEPH: Thank you. Thanks so much. WITMORE: Paterson Joseph is an actor and playwright. His book about the Royal Shakespeare Company’s 2012 production of Julius Caesar is called, Julius Caesar and Me: Exploring Shakespeare’s African Play. It was published in the US by Methuen Drama, a division of Bloomsbury Books, in 2018. He was interviewed by Barbara Bogaev. “Bear It, As Our Roman Actors Do” was produced by Richard Paul. Garland Scott is the associate producer. It was edited by Gail Kern Paster and Esther Ferington. Esther French is the web producer. We had technical help from Andrew Feliciano and Evan Marquardt at Voice Trax West in Studio City, California, and Robert Auld and Deb Stathopulos at the Radio Foundation in New York. We’d also like to thank Illuminations for allowing us to use excerpts from their DVD of the Royal Shakespeare Company’s 2012 production of Julius Caesar. On recent episodes of Shakespeare Unlimited, I’ve asked that you rate and review us on iTunes. This time, I’d like to tell you why that matters: podcasts with lots of ratings are the ones more likely to be suggested to other listeners. If you’re enjoying Shakespeare Unlimited and you think that others—people you don’t know—might enjoy it too, the best way to let them know is to rate and review the podcast. Thank you so much for your help.